Located just outside the Grand Teton National Park's east entrance in Moran, Wyoming tucked into the Bridger-Teton National Forest is Togwotee Mountain Lodge, the perfect mountain retreat for your family. This full-service lodge offers accommodations ranging from rooms and suites in the main lodge to one-bedroom cabins with fireplaces and kitchenettes for a more secluded option. Established in 1923, Togwotee Mountain Lodge has been welcoming guests to a western adventure with the same exceptional hospitality that the lodge was founded on in one of the most pristine wilderness in the world. 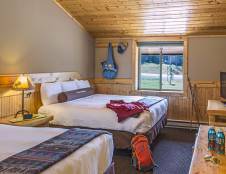 Guests can partake in numerous activities throughout the year including horseback riding, hiking, fishing, mountain biking and whitewater rafting in the summer and snowmobiling and dog sledding in the winter. To fulfill all your dining needs after a day of exploring, the Grizzly Grill is sure to satisfy as well as the Red Fox Saloon with its pub-style menu and signature, hand-crafted cocktails. This "home-away-from-home" is the perfect getaway for those looking for an authentic, Wyoming experience, easy access to the Grand Teton National Park and a beautiful, western setting in some of the most impressive wilderness in the area. Togwotee Mountain Lodge is seasonally open in the summer from the end of May through mid to late October and mid-December through the end of March for the winter season.